Onward to the second and third rows, where we’ll actually get to stuff that directly makes noises! And has orange knobs! But first: on the left we see a Pittsburgh Modular Lifeforms Dynamic Impulse Filter. This is a modern non-vactrol LPG with a classic design, with a mode switch that lets you select whether it’s going to act as a VCA, an LPG, or a lowpass filter. Its response to triggers is not to my liking, but it works well controlled manually or via CV. It has a uniquely woody tone, and controls that make it handy in any mode. 4/5. Filters reduce frequencies in part of the spectrum, while optionally emphasizing it in others (called resonance). A lowpass filter allows lower frequencies to pass through while quieting higher ones; a highpass filter does the opposite. A bandpass filter allows only a narrow band of frequencies to pass through freely, while a notch filter reduces only a narrow band of frequencies. A multimode filter typically will either switch between these or provide all of them simultaneously. Different circuit designs have widely different characteristics in terms of slope, resonance, stability, phase characteristics and so on. Many designs will self-oscillate when the resonance is high enough, producing very pure tones even without input. Equalizers (EQ) and tone controls are an especially gentle type of gentle filter. Next is the Doepfer A-196 PLL (phase-locked loop). This is a strange beast! Given incoming signal (audio rate or slower), it attempts to match the frequency and create its own set of pulses. It does this by constantly measuring whether it’s ahead or behind, and feeding back a signal to itself to make adjustments… but depending on settings, the material it’s tracking, and how much you intentionally confuse it, it can be joyfully terrible at its job. The open nature of this module lets you do all kinds of bizarre tricks with it. One of my favorites is patching in a different oscillator instead of its own — perhaps one that’s trying to modulate itself and therefore can’t properly track pitch without extra help. 4/5 (it’s pretty situational, and there’s sometimes a razor-thin margin of error between good tracking and garbage). A VCO is a voltage-controlled oscillator, which is the kind most relevant to us in modular synths. VCOs use the 1V/octave standard for frequency control and typically work at audio rates (20 to 20,000 cycles per second, or Hertz (Hz)) just like sound waves. The shape (or waveform) produced by the oscillator determines the sound (or timbre, which annoyingly is pronounced “tam-ber”). There are a few common ones in synthesis because they’re easy for analog circuits or very simple code to produce — triangle, sawtooth, pulse/square, and sine — but some oscillators can create extremely complex shapes. Generally, analog oscillators are prized for a sort of mythic “warmth” and other subtle qualities, while digital oscillators are much more diverse in terms of shapes they can generate as well as potentially more precise (or imprecise in specific ways). A common type of digital oscillator is the wavetable, which keeps shapes in memory and can smoothly change between them. 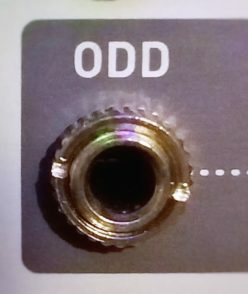 Other digital oscillators are based on mathematical models and algorithms computed in real time. FM, frequency modulation, is a synthesis method where the output of one oscillator modifies the frequency of another oscillator. Slow FM is just vibrato, but at audio rates the result is instead a change in timbre, which can be brassy or bell-like or incredibly noisy depending on the frequency ratio between the two oscillators. Many non-modular synths like the famous Yamaha DX7 actually use phase modulation (PM) which is similar but simpler in some ways. In the modular world, one deals with exponential vs. linear FM, thru-zero and other complexities having mostly to do with keeping things in tune while being able to shift the timbre at will. There’s also AM or amplitude modulation, which is simply controlling a VCA with a second oscillator harmonically related to the first but has somewhat similar timbral effects; RM or ring modulation, and filter FM which modulates the cutoff frequency of a filter at audio rates, producing a combination of amplitude and phase modulation. The next orange knobbo is The Harvestman Kermit, after Kermit Washington, the One Punch Man of basketball. It was designed as a dual LFO based on a small wavetable, but it will also run at VCO rates, where it’s very noisy and fizzy and unstable in a beautifully disastrous way. Something about it makes it especially well suited to amplitude modulation. It would benefit from fine-tuning knobs, normal-sized knobs for the modulation inputs, and remembering button states on shutdown. The clock/pitch following mode is a sloppy mess. But the sound is unbeatable, and it works very nicely for LFO purposes. 4/5. Then we have The Harvestman Tyme Sefari, named for a time travel company in a Ray Bradbury story. It’s a lo-fi digital audio buffer that can capture and play back audio — a very flexible sampler or a delay/echo depending on how you configure it. Like Chronoblob, it has an open feedback loop that adds flexibility. But unlike Chronoblob, the sound just can’t avoid being grungy and that doesn’t always suit. It’s also pretty large, especially with its expander module. There’s a firmware update supposed to be coming soon which should make it less glitchy, and I’m pretty much waiting to see what I think of that before letting it go for something else. 3.5/5. To its right is its expansion module, A Sound Of Thunder (which is the title of that Bradbury tale). This adds a second channel to the TS which can be used for stereo or other nefarious purposes. There’s no mix control though. It also adds some marginally useful options to make the sound even worse or to shift the pitch. It’s overly large for what it does. 2.5/5. Getting back to white knobs again, we have the Antimatter Audio Crossfold. This is a nice wavefolder with two inputs, which lets you crossfade between the two, control the folding amount two different ways, and fade between the original (or mixed) and folded signals. This combination of features gives it some great sonic versatility. 5/5. Here comes Bastl Cinnamon, a multimode filter. It’s pretty straightforward and sounds good, with some switches to make it rougher. I won it in a charity auction and it was supposed to have been the aluminum panel version, not wood — which is weirdly thick and doesn’t fit well, and makes the text labels hard to read. Still 4/5. Last are a couple of passive infrastucture bits. The Doepfer A-180-9 Multicore lets me make 14 connections between this rack and the case on the other side of my desk through a pair of Cat-6 network cables and very compact panels. (I am in the habit of keeping two lines to my audio interface, which on the other side are stereo outputs of one of my FX pedals.) Unfortunately I still had to run a separate ground wire between the cases to eliminate hum. If the two network jacks were both at either the top or bottom — and better yet, if they had a rear option — it’d be a little less unwieldy. 3.5/5. The last tiny module with a row of nothing but jacks is a Bastl Multiple. It passively connects all 9 jacks together, and you can configure it by snipping wires on the back. I divided this one into (2, 2, 2, 3) just to have a handy way to patch into 3 inputs and an output on the back of my audio interface. Cheap and useful, 5/5. The bottom row of the rack has just 5 modules, but the first one’s a doozy. It’s a beta test version of the Synthesis Technology E370 Quad Morphing VCO. It is the absolute monarch of wavetables, with four independent or coordinated VCOs. Borderline overkill. My main gripe about it is that dynamic linear FM is quite tricky to set up, compared to the ease of the Hertz Donut. I believe it could be solved with a software tweak (a menu option for a DC blocking filter on the FM input while in linear modes) but can’t convince the DSP guy to try it, so it is what it is. However, all the other audio-rate modulation you can do to the thing is fantastic — the internal 2-Op FM model, exponential FM, PM, AM, wavetable morphing, wavefolding — and you can create FM wavetables in the first place. And the cloud mode is stupefyingly good. So it’s a 5/5 for sure. The next module with a screen is Dave Jones O’Tool+. It’s a dual-trace oscilloscope, voltmeter, frequency meter, tuner, spectrum analyzer, and metronome. It’s invaluable for learning new modules, setting up tricky patches, solving problems and giving you answers that your ears don’t. 5/5. A patch is a “program” of modules and connections. It can refer to everything you’ve got set up at any given time or a functional subset; it can be a general term (a bass patch, a Karplus-Strong patch, a feedback patch) or refer to exact settings. The term is sometimes used outside the modular realm it’s also used to refer to a synth program or a configuration of gear. Some people diagram them or photograph them; I sometimes take general notes. A patch programmable module is one that takes on different behaviors depending on what’s patched into it — like the function generators I mentioned in the last post which can generate envelopes or LFOs, delay a gate signal, filter audio, smooth a stepped signal, and so on. Multifunction modules, on the other hand, require changing between different mode to determine the behavior. Of course, there are modules blur that line. The plain-looking module with the eight knobs is Epoch Modular’s Twinpeak filter. This has two inputs that can be mixed, and a knob to fade between a single lowpass filter mode and a dual bandpass. At the highest resonance settings it doesn’t continuously self-oscillate, but a trigger into the input will make it ring in a lovely percussive way for a second or two. I am not a big filter connoisseur since I lean more toward non-subtractive synthesis, but this one has proven itself to be pretty cool. 4/5 (a mix CV input would have been nice). Frap Tools 321 is a three-channel offset and attenuverter, with a pair of mix outputs (one mixes everything, the other mixes only the channels where you haven’t patched the outputs). Very useful for getting signals to the appropriate levels. I’m not in love with the tiny black switches on the black panel with tinier labels, but it does the job. 3.5/5. Finally there’s the S********k S***r P***r G***n. It’s a power supply module. Some time after I bought it, the owner of the company revealed himself as a misogynist alt-right toolbag and proud trust fund baby who, he says, doesn’t need any of us. So I covered his logo with sparkly star stickers and never did business with him again. The power supply works okay. More happily, behind the panels I’ve got a Genus Modu Low Impedance Bus Board (LIBB) helping to distribute that power and keep it clean. And here’s the bit where I get into what’s in my modular synth cases, and what I like and don’t about each bit. I’m going to take it slow, and try to keep things as interesting as I can for people who are new to synths and for more experienced types curious about what I’m using and what I think of it. As a result, this is going to take a few posts. Let’s start with the rack on the left side of my desk. It’s a desktop 19″ rack stand, of the kind you could fill with servers and backup drives, or with mixers and effects. At the bottom I’ve left one space empty for cable clearance, and then a 1U power switch bank — handy for devices without their own switches, and also for rebooting the router and cable modem without crawling under the desk. Left: A “monitor lizard” who lost his natural habitat back when I went from a CRT to LCD. Middle: CV.OCD by Sixty Four Pixels — a very customizable MIDI converter with 4 CV and 12 gate outputs. With this I can sequence notes, other gates, and synchronize from the computer to modular gear. I have mine set up so MIDI channel 1 outputs pitch, velocity, gate and an extra trigger; channel 2 and 3 each have pitch and gate; channel 10 assigns five specific notes to gate outputs, and there are three clock sync signals at different divisions. A quick bit about how Eurorack modular synths communicate: they don’t use MIDI, they use analog control voltages (CV). Each patch cable carries one signal. Signals have no intrinsic meaning and are left to modules to interpret, but there are some typical signal types. Frequency (pitch) has a standard of one volt per octave (“V/OCT“). Gates, which determine whether a note is held or some other temporary event is active, are either “low” (0V) or “high” (some arbitrary positive voltage). Triggers are simply short gates and the important part is the rising edge where they jump quickly from low to high. Clocks are triggers that repeat to define timing. Audio is a voltage that fluctuates quickly enough to be audible if connected to a speaker. Everything else is probably modulation of some sort, though a fixed steady voltage is often called a reference or offset. These signals are mostly interchangeable, with varying standards and consequences — discovering these is part of the fun of modular. Right: The thing with the eye is a Bleep Labs Thingamagoop 3000. It’s a weird sound generating toy with a “LEDacle” that can blink in different patterns and speeds, and a light-sensing eye that responds to it (or other changes in light and shadow). Good for drones and weird warbly noises, I don’t use it often but it’s fun to play with. It can generate and respond to CVs too, but it’s much easier to just use it standalone and only tap its audio output. Bottom: Focusrite Saffire Pro 40. This is how I get audio in and out of my computer. 8 analog input channels, some output channels, plus digital I/O that I’m not using, with easily accessible level and monitoring controls on the front. Perfect for my needs, except it’s Firewire rather than USB and initial setup was kind of a fight. My top row of modules starts with Manhattan Analog DTA on left. This one was a prototype unit I bought directly from the maker. It’s two single channel VCAs in series, plus an extra drive stage to add some saturation and weight. Not the controls I expected (which would have been a manual bias as well as CV level) but still useful. Shame it’s AC-coupled. I’d rate it a 3/5 with no rancor; it’s not exciting but it does its job pretty well. An attenuator is just something that brings the voltage closer to zero, but this is vitally important in modular. An attenuverter can also flip it between positive and negative. An amplifier pushes non-zero voltages farther from zero. All of these are multipliers — attenuation is multiplying by a value between 0 and 1, attenuversion multiplies by a value between -1 and 1, and amplification multiplies by a value higher than 1. This brings up unipolar vs bipolar signals — which is simply whether negative voltages are expected or ignored. Audio is bipolar, but the control input on a VCA is typically unipolar — send it a negative voltage and it remains fully silent. But there are bipolar VCAs which invert the incoming voltage if the control input is negative. These may be called “four-quadrant multipliers” or “ring modulators” or “balanced modulators” because apparently one term for the same thing wasn’t enough. AC-coupled means it responds fully only to audio signals; any signal that changes too slowly will fall to zero. There are some technical reasons why one might want this, but usually DC-coupled is preferable since you can manipulate non-audio signals with it. The second module is Instruo tanh, which has three channels of smooth saturation/limiting of audio or control signals. This can give audio a bit more of a push or “warmth” depending on levels and usage, can be used to keep feedback somewhat under control, or can be used to give extra curvature and interest to control signals. I like running envelopes through it to give them a sort of “sticky” feel (words fail a little). 4/5; those mini knobs are tolerable but not lovable and to really help with feedback control it needs an attenuator afterwards, and I feel like two channels with attenuation would have been nicer than three without. Next in the line is Rabid Elephant Natural Gate, the holy grail of LPGs. The sound is gorgeous, the panel finish and art are gorgeous, even the box it came in is gorgeous. It’s extremely controllable and playable, with easily tweaked manual “open” sliders as well as decay times and a 3-way response curve switch. It also has a tendency to get louder if you trigger it rapidly, which can intensify the drama. I had the chance to try it at KnobCon Six, and bought one within minutes of the release announcement. Since then the demand has skyrocketed and the price has increased significantly due to the need to switch to a different contract manufacturer. But it’s soooo good. 5/5! An LPG or lowpass gate is related to VCAs, but as the control signal decreases, the higher frequencies (treble) go quieter more rapidly. This can give more natural dynamics and is favored in West Coast synthesis. VCAs respond immediately to changes in control voltage, but LPGs close (go quiet) more gradually than they open. A quick trigger to a VCA would let through a “beep”, but the same trigger to an LPG would give a natural, percussive “ping” or “strike.” This is such a common usage that some people forget you can use an envelope with an LPG just as with a VCA. Classic LPGs use an electronic part called a vactrol, which were originally made using toxic materials. The EU has imposed strict limits on them in recent years. They also vary a lot in behavior and have to be hand-picked for desirable response. It’s possible to make vactrols using greener materials, but overall they seem to be falling out of favor, replaced by other circuits or digital emulation. Soundmachines LS-1 Lightstrip: a handy touch controller that my spouse bought me last year. It will generate both a gate and a voltage according to where you tap or slide your finger, can hold the last touched level, and it can record and loop a few seconds of movements. Run it through a scale quantizer and you can use it like a micro keyboard! 4/5; sometimes the hold or record modes activate when you don’t expect, or don’t when you do expect. A quantizer takes a signal and “rounds” it to match the nearest note value. Some round to the nearest 1/12 of a volt, while others let you choose between different scales or define your own. It’s like imposing frets onto a fretless instrument. This is great for random signals or imprecise controllers, and can be fun when sliding between notes. Make Noise Contour is the aluminum one with the vertical row of four white-capped knobs. It’s a basic ARSR envelope generator similar to Moog designs, with adjustable response curve. The first envelope I tend to reach for when patching the left rack, it’s just so friendly and easy to dial in. 4.5/5. Envelopes are often described by various types of stages: A for “attack” (onsite or rise), “D” for decay (fall), “S” for sustain (hold steady while the gate is high), “R” for release (a separate final decay after a sustain), and “H” for hold (hold steady for a fixed time). D: immediate rapid onset followed by an immediate decay, like a percussion instrument or plucked string, or a vactrol strike. Gate time is irrelevant, this envelope treats its input as a trigger. If another trigger is received while still decaying, behavior can vary from module to module. AD: rise to maximum, followed immediately by decay to silence. Again, gate time is irrelevant, and the behavior when receiving a second trigger can vary from module to module. AR (or ASR): rise to maximum, sustain while the gate is high, and release to silence. If the gate is released while still in the attack stage, immediately release. Many AR envelopes are implemented by slewing an input signal. That is, if the input voltage rises, the output level rises more slowly. If it falls, the output level falls more slowly. If the input happens to be a gate, the result in an AR envelope. If it’s stepped voltage levels, the result is smooth voltage levels. If it’s audio, the result is filtered audio (or silence if your attack and release are too slow). Modules that do this (and also AD, using a separate trigger input) are often referred to as function generators, and typically have EOR (end of rise) and EOC (end of cycle) trigger outputs in order to chain and synchronize other events. ADSR: rise to maximum, decay to a specified sustain level, hold while the gate is high, and release to silence. With a zero sustain level it can imitate an AD envelope, and with a maximum sustain level it imitates an AR envelope. ARSR or ADSD: a simplified form of ADSR where the decay and release rates are the same. Multistage envelopes can have multiple stages of various types, as can vector envelopes which define level over time with a series of X and Y coordinates. Even rare are “spring” and “bouncing ball” envelopes based on physics models. ADSR is the classic East Coast envelope. AD and AR envelopes, and function generators, are generally associated with “West Coast” synthesis. AD envelopes typically have a loop switch which allows them to rise and fall continuously, taking the place of the LFO (low-frequency oscillator) which is more typically East Coast. All this East/West stuff is largely an arbitrary historical distinction between how Robert Moog and Don Buchla designed their synths. While there’s some truth that certain design philosophies work together well, the “coast thing” should not be taken too seriously! To its right is Make Noise Function, a function generator that also has a “hold” function that freezes its current level. Much like Contour, the knob ranges and response just make it super easy and “musical” feeling. 4.5/5. And then WMD/SSF Mini Slew, another function generator. This one has more CV inputs and a built-in VCA — it’s cleverly arranged as an attenuverter for one of the module’s outputs, with a bipolar CV in jack. You can run audio through that CV in jack, and the module’s envelope will control its volume. But the response of the controls is much more fiddly than Function, the EOR/EOC outputs are a bit flaky, and unless the trigger is above about 6.5 volts, it won’t retrigger during the falling stage — which can be advantageous but it’s an awkward default. And for some reason it requires twice as much current from the power supply as Function. 3.5/5. Normalled connections are default connections that are interrupted when you plug something into an input. For instance, on the DTA, if you don’t plug anything into a CV input, a constant positive voltage is normalled there instead so you can use the knob as a manual volume control. The same is true of the audio inputs on Natural Gate, so you can use it as a D envelope generator when it’s not processing audio. The module with the cute pink blob is Alright Devices Chronoblob, a digital delay effect. I have a lot of delays in software, but it’s good to have at least one in the modular system as well. 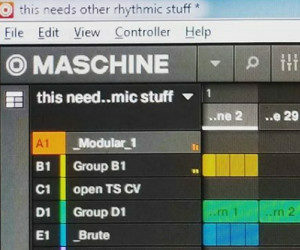 What makes this module special is (A) a sync input which lets you lock delays to the beat, (B) the choice of whether to change delay time with a smooth tape-like pitch shift or a clean crossfade that lets you bounce delays all over the place to create interesting patterns, and (C) send and return jacks for the feedback loop which let you affect the echoes or do some other clever hackery. 4.5/5 (a level input knob would have been swell and a clean feedback limiter would have been ultra). Ending the first row is a Doepfer A-138m matrix mixer. This has four inputs on rows, four outputs on columns, 16 knobs to assign them, a switch to choose bipolar or unipolar control of each column, and the top row is normalled to a constant voltage. It can act as a manually controlled voltage source, independent attenuverters or mixers, a handy way to mix sources in stereo, control feedback, rearrange the signal flow of other modules patched into it, and even can be used for sequencing by feeding it combinations of gates. 4.5/5 (higher frequencies can leak through just a little even when the knobs are turned down fully). A sequencer stores sets of voltages and/or gates as discrete steps, and can play them back synchronized to an internal or external clock. Sequencer designs vary widely to cover many different needs and styles of composition; some have multiple channels, are rhythm-oriented, can rearrange the step order, and so on. Since musical pitch is a primary use for sequencers, many have built-in quantizers. 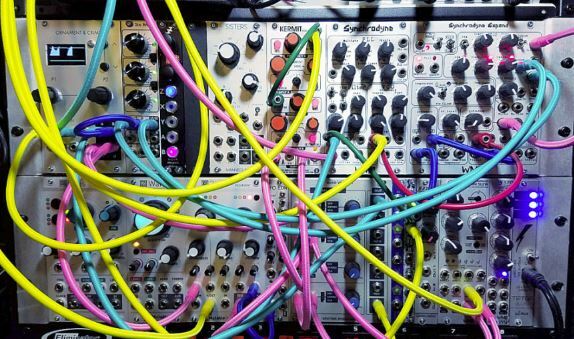 Modular synthesizers look, at first glance, needlessly complicated and difficult. One might wonder: why not just use a computer and plugins, or “normal” keyboard synths? That’s certainly what I thought when I first saw Eurorack gear in YouTube videos a few years ago. 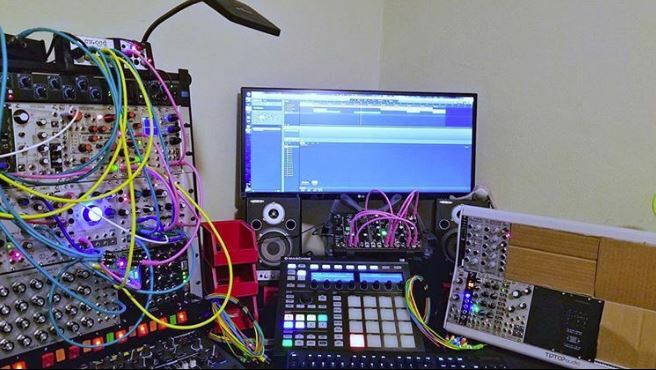 This is roughly half of Richard Devine’s system. My full setup is maybe 1/4 of this? But individually, each piece is relatively simple on its own — if not in function, at least in concept or purpose. All but the most exotic modules can be thought of as a single building block or a group of related building blocks. And we tend to acquire them by ones or twos, giving ourselves time to get familiar with each individually. System size can vary from just a couple of modules in a “lunchbox” style case or DIY with cardboard, to modest portable rigs, moderate home studios, or intimidating walls of gear. Some people will keep every module they buy or build, while plenty of us trade frequently to keep it fresh or to pursue the perfect setup. Modular synth types often call this “the journey” — the gradual process of researching, building, learning, and creating with one’s own unique synthesizer(s). You will see the phrase “my modular journey” all over message boards and interviews, and it feels apt. I think Holst would have loved this version, while wondering where his name was. This one and Firebird were my favorites. 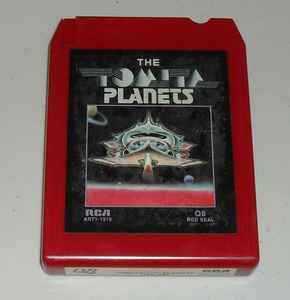 70s: I grew up wearing out my dad’s 8-track tapes of Isao Tomita and Wendy Carlos, playing with casette recorders and a Magnus chord organ. 80s: my first synth was a beat-up Micromoog, but like almost everyone else at the time, I soon craved the new wave of digital synths with polyphony, MIDI, cheesy electric piano presets, etc. Also a science teacher gave me his old oscilloscope. 90s: a little bit of messing around with old MIDI gear and computers, but nothing too serious. I have maybe a dozen recordings from this era and they’re generally not good. 2016-2017: a new band name and a “song a week” project that went a little nuts. I now think of that period as my internship. Fall 2016. A DIY bamboo box and a few Mutable Instruments modules from a charity auction and holiday sale, to accompany my Arturia MicroBrute. And terrible cables. Spring 2017. An experimental sound laboratory. Late summer 2017. I’d started to find a new focus in my music, and chose my gear to favor “West Coast” synthesis and wavetables to suit it. Winter 2017-2018. I was honored to beta test (and keep) a SynthTech E370 and Mutable Instruments Plaits, Stages and Marbles, so I needed a second case to make room. Summer 2018. Went through several iterations of sequencing modules as well as effects in both Eurorack and pedal format. Some of my albums have used little to no MIDI sequencing, but combinations of algorithmic and simple sequencers as well as manually controlled drones. Fall 2018. 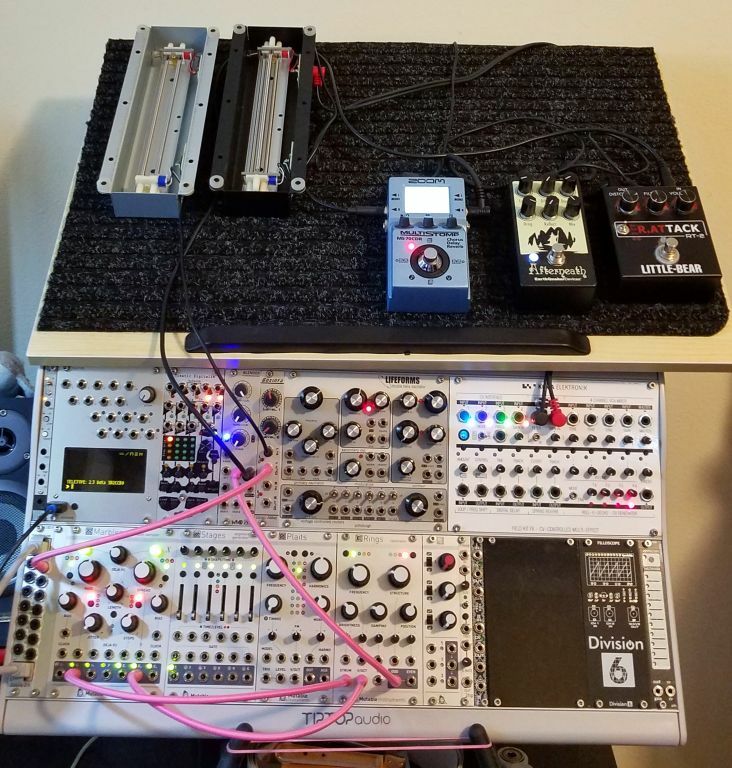 I declared my modular system to be at “version 1.0” with the notion the pace of changes would slow greatly, and I’d soon finish the pedalboard with a couple more pieces of gear. I realize I did not yet answer the “why” part of the question at the beginning. For that, I recommend the YouTube series Why To Modular by Knobs. All of Knobs’ videos are just dreamy, but this series does a fine job talking about part of why nerds like me find modular synths so compelling. For me, it’s been about access to sounds and techniques that I wasn’t getting in software, and the removal of a lot of artificial boundaries and habits that most musicians who only use VST plugins aren’t even aware of. I have learned a ton about synthesis techniques and found immense satisfaction in exploring the possibilities, and as I’ve said, found “my sound” in the process. 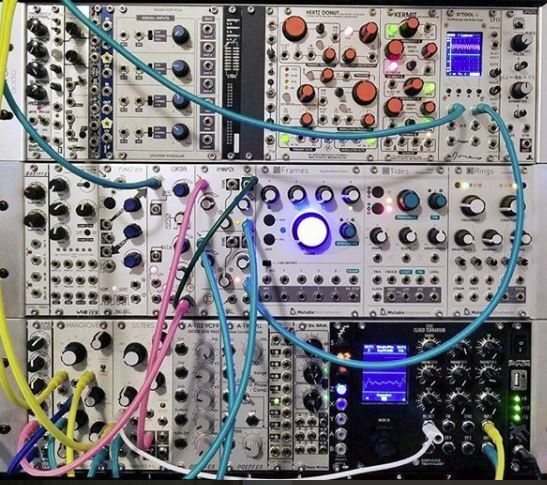 And yes, there are modular synthesizers available in software now, including VCV Rack and Softube Modular which not only imitate Eurorack format, but include officially licensed software ports and emulations of real modules. But the experience isn’t the same, and that’s important. These are musical instruments, not scientific instruments, and the feel matters. To paraphrase someone or other, it’s like the difference between playing a video game about mountain climbing, vs. actually doing it. When I create songs, I do it in a single session whenever possible, or two if necessary. From the point where experimenting/jamming crosses my “I have to make this a song” threshold to when I put the headphones down and walk away, it is rarely more than 4-5 hours. The next day when I listen to it? It’s fine! It’s not that I have some kind of house elf who comes in and fixes my recordings while I’m off sleeping or playing video games, it’s just my perception. (A) I’ve been listening to variations on the same thing for a few hours and am getting pretty jaded, vs. (B) I have fresh ears and am listening to a 4-9 minute song in the context of other things I’ve recorded recently. This method of working quickly has been really helpful to me. Through 2016-2017 I recorded over 380 songs this way. After several months, I found myself consciously critiquing my overall output and realizing that some things worked and others didn’t. Decades of scattershot music-making — trying to do almost everything that interests me, which is a lot — were brought into focus. After a few more months of refining both my gear and technique, I started recording albums again with this new focus. David Bayles and Ted Orland, Art & Fear. 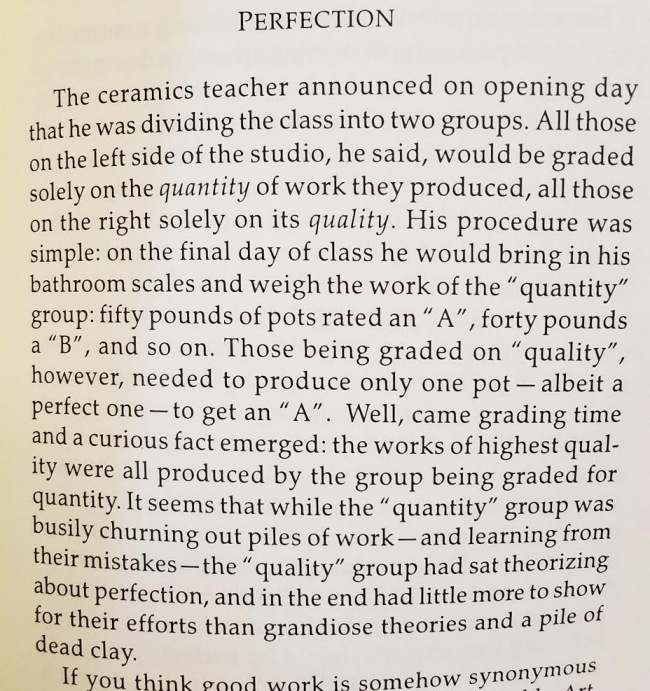 One of my favorite things I’ve read this year. Going back to make little tweaks and adjustments and additions to a song dozens of times didn’t really serve me so well. Many changes didn’t necessarily improve anything, just make it different, satisfying my ear fatigue. More importantly, those changes only affected a single song — what I needed was to improve my whole practice. I stopped arranging the pine needles in my forest just so when I realized I preferred oaks anyway. It would be nice to tell the story that I went to this single-session thing as part of a grand plan. Really, the single-session thing was driven by my transition from 100% software music-making to a mixed approach — and some faulty, unreliable little desktop synths I was trying to work with at the time — and the fact that using these synths meant taking up space on my desk that I needed for other things. It was easier to just get it done and put it away, than to keep it set up and running for multiple days while hoping nothing would crash or get accidentally unplugged! “I think the modular sound has less to do with timbre and more to do with the fact that when people are patching a modular, they seem to be less interested in micro-management as a music-making process. The extreme magnification of musical event time and pitch provided by modern DAWs seems to curate what people believe to be perfect music through the aid of a machine. My process is this: I set up the entire song: sound design, composition, sequencing and/or performance plan, mixing, effects, all of it. And then I record it “live” to a stereo channel. If I feel it’s a good take, that’s it — it’s committed. I take notes to satisfy my later curiosity, shut it down and unpatch the modular. There’s no multitracking, no going back and making small changes or revisiting mixing decisions. The only editing possible from that point is on the “finished” mix. Sometimes a lot does happen in that editing, but generally it falls into “mastering” enhancement and cleanup, or bold-stroke creative changes — not revisiting past decisions. Always moving forward, no going back. Regret that I can’t make those changes is rare and minor at most. For all of the fear that some people have of working with a synthesizer that can’t save presets, this is never a thing that has bothered me about modular synths. Instead of saving and loading sounds with perfect recall, I remember general techniques that will lead to new creations in the future. Always moving forward! As the sidebar currently says, my current musical project is an album called Materials. It’s the kind of music that I have been making — the dark side of ambient, spooky, unsettling, etc. — but it’s also a study of Mutable Instruments Rings. Rings, a physical modeling resonator, is one of the most popular Eurorack modules (#4 if you can trust ModularGrid) and with good reason. The easiest way to use Rings is to just send it a pitch and optionally a trigger signal, and it produces a lovely plucked string or struck bar or membrane — sounding like metal, glass, wood, etc. Guitars, xylophones, some types of drums and so on are in easy reach. But its ease of use, popularity and beauty have made it something of a cliche, and there’s a backlash against its easily recognizable sounds. Like any good backlash, there’s a counter-backlash. The module’s designer and some musicians such as Billy Gomberg point out you can think of it more as a sort of filter/reverb. Feed any audio source into Rings (including itself) and now instead of tapping those strings and plates, you’re bowing them, rubbing them, blowing air over them, vibrating them sympathetically… really it’s entire worlds of realistic and impossible materials for musical manipulation. Rings was the module that got me into Eurorack in the first place, and I was doing this “fancy” stuff on my first day with it. To me it’s what makes Rings so good. The challenge has been holding back from centering other stuff that I really like — but coming up with myriad ways to use Rings that don’t “sound like Rings” has been fun and easy. I have a whole list of things I could try that I will probably never get around to. 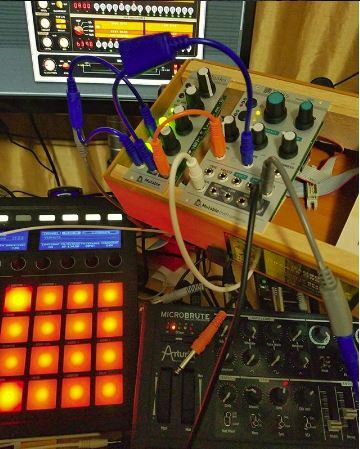 I even wound up trading a couple of less favored modules for a second Rings — they work really well together. 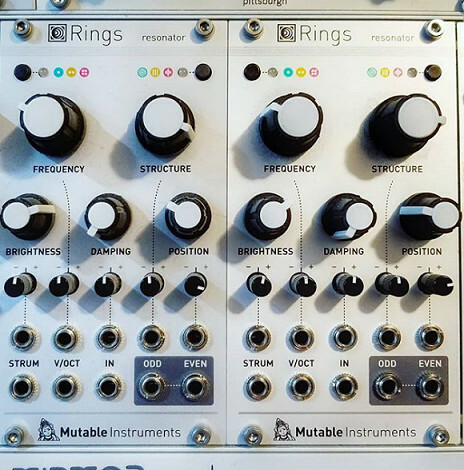 Overall, I feel like the best partner for a Rings is Plaits, Mutable’s versatile “macro oscillator” that incorporates many different synthesis methods. But when you have a whole modular synth to work with, plus field recordings, software synths, samples of acoustic instruments, and so on there is really no limit. Yesterday’s effort used Rhythmic Robot Hurdy-Gurdy as the sound source for the first Rings, which then fed the second Rings. Strings vibrating strings vibrating strings! The gurdy and both resonators were mixed and run through reverb and a touch of distortion and filtering. Here is the result. Doesn’t really sound like a guitar or xylophone, does it? …when your electric company (which primarily runs on coal) mails their customers postcards saying they can save the environment by switching to paperless billing. Any sort of stripes painted on roads or parking lots. Headlights in rain, snow or fog. Headlights in the dark (until the sun has been down for one full hour AND the car has been in motion for at least five minutes). The use of pedals to control a vehicle’s speed. Maybe you’ve never wondered how I come up with song titles, but there is a thread on Ambient Online about that question, and reading it today coincided with an update from one of my favorite sources of name inspiration. I’m sure I’ll write plenty later about my process(es) for creating music, but this is what happens after. Or during. Or before! 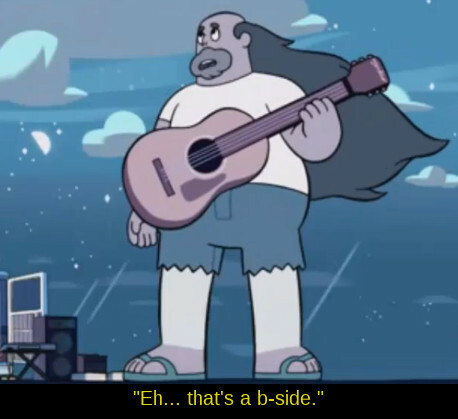 Sometimes, songs name themselves. I’ll be finishing it up and stop to listen through, about to record, and some impression will strike me and lead to a name. 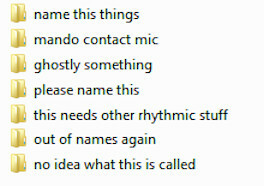 Or not, and I might just pick a temporary name so I can save the project file, and get around to a real name later. Sometimes I have a theme in mind for the album, and that helps me choose a name. Although in the case of Nereus, I already had most of the album done when the theme struck me, and I wound up renaming several songs (some of them, several times.) I had to keep a chart for a while so I wouldn’t lose track. When all else fails, I consult my list. Whenever I invent or find a turn of phrase that I think has a remote chance of working — or when my spouse suggests it — I put it on my “Song Names” note in Simplenote. Most of the things on this list will never be used, and sometimes I cull the least interesting and least likely. But sometimes going over the list and finding these goofy phrases will trigger a better idea. 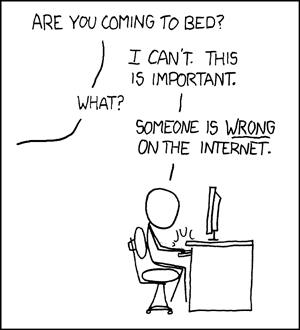 Also contributing to this list: the neural network antics featured on AI Weirdness. During my period of prolific exploration in 2016-2017, I leaned on it quite heavily, giving such fantastic titles as “Zuby Glong,” “Crab Water,” and “Corcaunitiol.” I haven’t used it so much on my album releases, but again, sometimes those random strings trigger some ideas. he was a wizard, and explained that he was in a small town of stars. How could one fail to be inspired by such poetry? Another great source of names, phrases, and inspiration is Botnik Predictive Writer. Being both themed and somewhat human-directed, it tends to make actual coherent phrases.